In the end, they're satisfied and I'm happy with what I have created specially for them! The twins will be five years old this coming Tuesday! Happy birthday to my wonderful twins-Allyson & Anders! 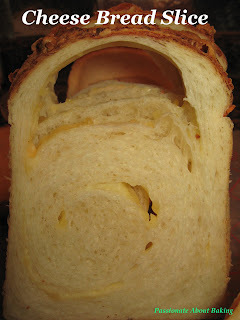 With some time on my hand, I baked two loaves of Cheese Bread from Alex Goh's "The World of Breads". 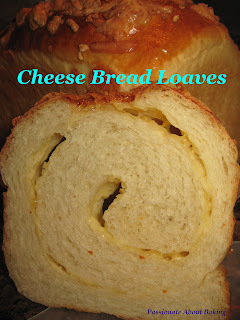 These cheese loaves included some almond nibs. They looked real nice though! Just for fun, I drew on the breads! ;) Enjoy! 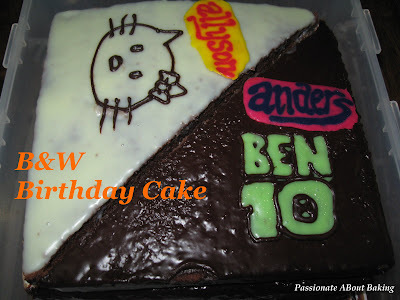 Disclaimer: Hello Kitty & Ben 10 designs are for my own personal use, not reproduced for sales. That is such a cute idea! And a really smart one to keep both your kids happy at the same time. Happy birthday, Allyson and Anders! Tats such a cute and nice cake! Very innovative as well! If im ur kiddo, i'll polish the whole cake off! hehe.. I have the same problem trying to meet my two kids' different taste buds! Luckily they are not twins, I doubt I will be able to come up with such a great idea! It's my turn this week to crack my head on how to go about making my boy's bday cake, wish me luck!!! You are so blessed to have a twins and your twins are so blessed to have a wonderful mum like you. God bless you Jane and Happy Birthday to Allyson & Anders! Thanks a lot! Yes, it's both a challenge and a blessing to have fraternal twins. They are just WORLD apart! Hahaha... Thank you for your blessings! Wow , you are so smart!! I faced the same problem as you. 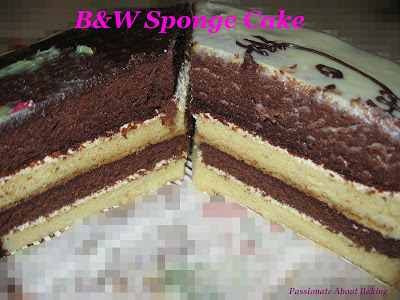 Both wanted different cake and the design the choose are those tt 2-3kg minimum!! I was like... how are we gg to finish 4-5kg of cake?? Happy Birthday to Ally & Anders! Thanks! The kids are just enjoying their "special" day & holiday these two days! Wonder Twin Power - ACTIVATE!